My new desktop is in a corner of my house and the boardroom is the dining room table. I was the beauty director at a big national magazine when bloggers started attending press events with their Lauren Conrad brand of grins and floaty, boho tops. They were so so giddy and excited to be invited to the launch of a new lipstick. The rest of us, the editors, stood by with with our free designer bags on our arms watching their naive fervour with disdain. After all, we were hardworking journalists, not blasé work-from-home bloggers. We came to ask serious questions about the ingredients and the development process. We had a huge audience to satisfy and big publishing companies to report to. We were not there to simply swoon. We were print. Hear us roar. That was almost 10 years ago. Since then digital publishing, blogging or whatever you want to call it has ballooned (to say the least). Everyone has something to say. Everyone has an opinion. Everyone wants to ask a question or give an answer. Everyone wants to show you a how-to. Everyone wants to gush on youtube, snapchat et al. And guess what? Now, I’m a blogger. Now I’m everyone and I love it. And I’m sorry to all the bloggers before me for being such a snob. I still don’t possess a Lauren Conrad game face (those who know me will whole heartedly agree), however I have started wearing floaty boho tops, only to hide my middle which isn’t as lean as it was when I was working full-time (we won’t discuss the fact that that was only two years ago and I’ve already gone up a size, crikeys). Wanna know the most liberating creative a-ha moment I’ve had so far? I’ve learned short sentences are okay. (Full stop). My phrases no longer have to be laden with of-the-moment metaphors and insider references trending on Vogue, Vice or The New York Times. For example, I can write: “I like this painting because it makes me feel happy.” As opposed to: “The bold and unapologetic strokes of this post-post-modern example renders a state of higher consciousness and glee that Alain de Botton would applaud.” Not to say that blogging has to be dumb or simple. It just allows a freedom of expression sans the scrutiny of a well-meaning house style or healthy writerly competition. I’ve learned digital swooning, which used to make me feel gross and cheap, is simply online etiquette. During a time when the interwebs is breeding headline hate, scorn, bullying and racism, the worldwide cult of encouraging comments is a welcome pick-me-up. Even when a happy face emoji seems lazy or inauthentic, I’ll take the accolades, especially if it makes me feel #uh-mazing. Cos here’s a #realbloggingtruth, especially when you’re just starting out: Comments are your pay cheque. Cash them in when you can. I’ve learned it’s awesome to write for a few women—just like me—and not a million or more women who may not share my beliefs (which is basically a non-dogmatic version of let’s be good to one another), point of view (liberal, obvs) or style (more LA than NYC as I get older). After years of being trained to boost readership and web site clicks with watered down repartee that straddles millennials and baby boomers (a nearly impossible task by the way because one team doesn’t know who Gigi Hadid is and the other doesn’t know who Gidget is), it’s a relief to reach out to just enough women who get my jam. They know there was Charo before Sofia Vergara and C. Thomas Howell (a.k.a Pony Boy) before there was Zac Efron and they were in high school or college when they vividly remember Marc Jacobs did grunge for Perry Ellis as reported by CNN’s Elsa Klesch, naturally. I’ve learned blogging is as important as the printed word and image, which was a really big mind game I had to overcome. Sure there may be grammar and spelling mistakes and the photos may not always be worthy of a ream of paper at the printers, but people are reading, commenting, liking and following. We’ve heard from moms and dads in London, LA and Hong Kong. 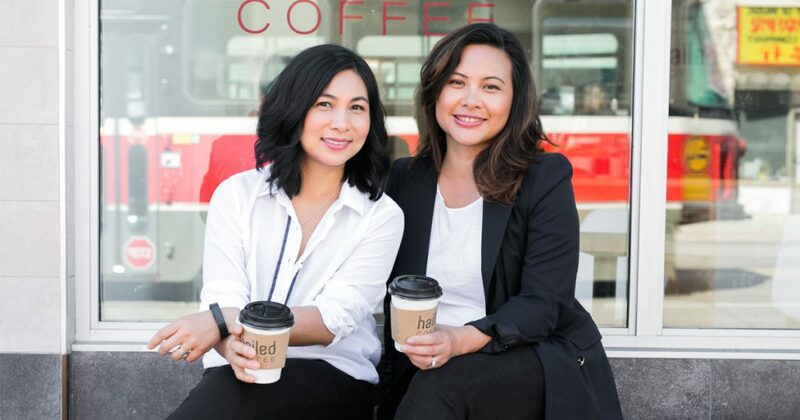 They have their hearts and minds open to what Tracey and I have to say and not because we’re a big brand seeking eyeballs but because they appreciate we’re two moms who are trying to figure out this whole life, work and motherhood thing from our little corner of the world. I’ve learned everyone feels better when we share mistakes and triumphs in real time, especially when we’re all trying to do our best. I wish I could also say I’ve learned all about search and social media strategies and Google analytics—but I haven’t. That’ll come later, after I’ve finished telling all the stories I want to tell and after meeting all the amazing personalities we like to feature. Hopefully once I’m good and done with this blogging thing (if ever), all those numbers and stuff won’t matter anyways. You can read all about my full-time to freelance transition here. Love, Mom shares inspo from 2 modern mamas who aren’t afraid to tell it like it is. We’ll help you explore everything that makes us tick: Career, style, beauty, decor, travel and so much more. Read our story here. @2017 - Love, Mom. All Right Reserved.